Wario's House as seen in WarioWare: Smooth Moves. Wario's House is a minor location in the WarioWare series, where it is shown to be in Diamond City. Wario remodeled it as the headquarters of WarioWare, Inc., although it was restored after the events of the first game and moved from the top of a mountain to lower ground. Wario still controls his company from that location, although he usually just sits in front of the TV. In WarioWare: Twisted! the music box from Wario Land 3 is displayed on Wario's desk while a picture of the Golden Pyramid from Wario Land 4 appears on the wall beside it. 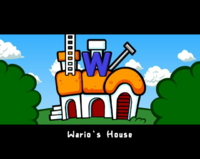 In Wario: Master of Disguise, Wario's House can be seen in the intro movie and the main menu screen, where he once again relaxes and watches TV. Wario's House reappears in the game Game & Wario. The house appears in the opening intro, which shows Wario sitting in his home, watching television before he realizes he needs to make a game. In WarioWare Gold, the house has moved to the top of the Diamond City Stadium. Wario plays his Nintendo 3DS on his chair in his house during the intro. It is also the place where he records the announcement for the "Wario Bowl" games. During the Story Mode intro, it is revealed that Wario has a trapdoor below his chair that he uses to transport to a computer room. Wario has been depicted to own several different homes. In Mario & Wario, he is originally shown residing in a manor. In Wario Land II and Wario World, he is shown residing in a castle, which he eventually acquired with his treasure-hunting wealth. ↑ Made in Wario Japanese opening. This page was last edited on January 15, 2019, at 20:51.